Quest'estate sono in fissa con le righe: azzurre su fondo bianco! Credo di aver acquistato una quantità incredibile di camicine e top con questa stampa senza rendermene conto! 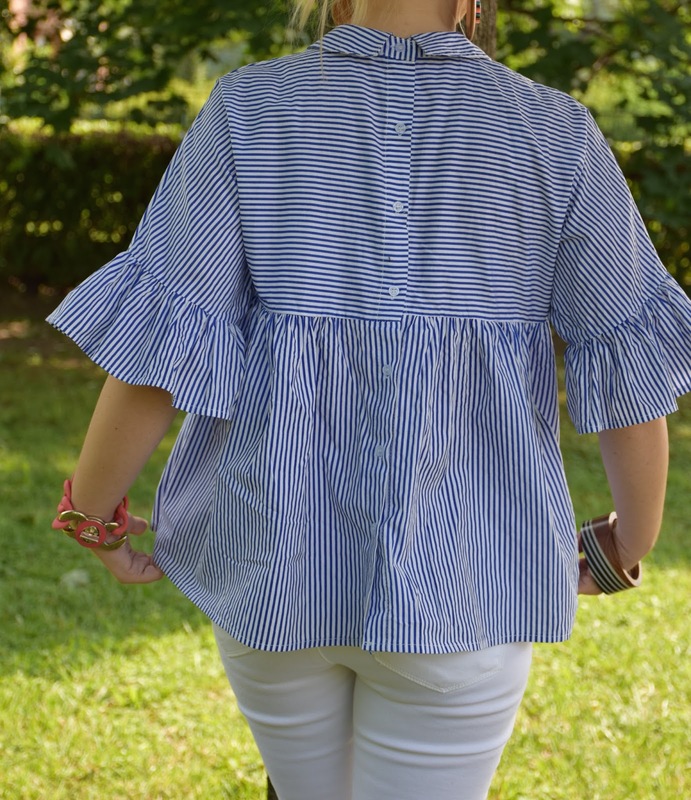 This summer I'm obsessed with stripes: blue on a white background! I think I've bought an incredible amount of shirts and tops with this print without realizing it! Ampia, bon-ton con i must have di stagione: rouches e volant e ricami floreali. L'ho abbinata a jeans skinny bianchi e a zeppe con pon pon. Wide, bon ton with seasonal musts: ruffles and flyers and floral embroidery. I combine it with white skinny jeans and pon pon edges. if you pick up dresses, http://www.britishdress.co.uk gives you amazing choices. only the most beautiful beautydress evening dresses reviews canal walk are meant for a perfect beauty like you! Not everyone is born with a good fashion sense, but everyone can learn how to dress in a way that’s stylish, comfortable, and most importantly, suits your lifestyle and personality. When you develop a good http://www.glamchase.co.uk/ dress boutique warrington reviews sense you will be able to walk into any store and know which clothes are right for you. A good http://www.glamchase.co.uk/ occasion dresses for teenagers reviews sense means knowing what works for your body type, your age and your skin tone. Beyond this, it means feeling confident in your look. Schöne Mädchen, ich weiß, jeder will mehr und mehr schön. Finden Sie ein passendes Kleid, jadegowns bochum abendkleider outlet reviews es gibt viele Stile, hier sind schöne und elegante Kleid, verpassen Sie nicht oh meet.If Sie brauchen Kleid, kann ich Ihnen einen sehr günstigen Preis.